Design is an iterative and social process -- the evaluation of choices and outcomes early-on, before committing to a course of action. By rapidly exploring possibilities -- through dialogue, analysis, and prototyping -- awareness is built and better results are achieved. And as things change (they always do, don't they?) a good design is easily adjusted. Project Design is the capability to model, explore, and optimize complex projects and programs -- for teams to design their projects -- before committing to action. Isn't designing before doing just common sense? NASA wouldn't build a new spacecraft without computer designs and simulation of in-flight performance. Ford would not put a new vehicle into production without computer modeling to test the design’s response to various driving conditions. Investment firms simulate many performance scenarios before committing large amounts of funds. If our projects are increasingly complicated, shouldn't we design them too? Customers, investors and regulators would roundly criticize any company that would “bend metal” without first subjecting designs to the rigors of modeling and performance simulation. Yet thousands of companies wade into complicated, multimillion dollar initiatives without the benefit of looking ahead with Project Design. Some companies confuse excruciatingly detailed project schedules and budgets with effective project design. Traditional scheduling and reporting methods overlook nearly half of what actually determines the ultimate outcome of these projects and programs. They miss the opportunity to examine the complex interactions that will determine whether their efforts are likely to meet expectations. Attention to the cost, time and risk associated with realistic phenomena and dynamics of teamwork, including coordination. Coordination is real activity triggered by habits and dependencies as they stretch across the project's architecture. Coordination includes communication, meetings, travel, decisions, waiting, and rework common in most projects and programs – particularly in this age of global teams, extended enterprises, outsourcing, competition, quality and speed-to-market. Traditional planning (including CPM, PERT, and other techniques) simply ignore or assume away these realities. After all, Gantt charts were developed a century ago to control fixed duration and sequenced tasks in factories, hardly the kinds of teamwork most projects are faced with today. 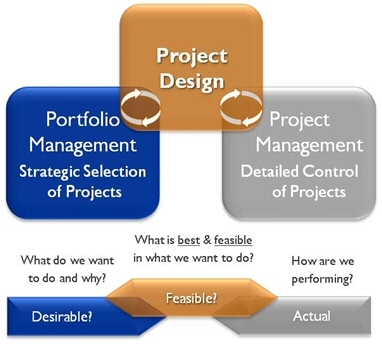 Project Design is the capability needed by teams to perform in today's dynamic teamwork environment.